A new study published today in Botany demonstrates how herbaria can be valuable resources for studying the impact over time of large herbivores on perennial plant populations. Herbaria are collections of plants and plant parts, carefully dried and arranged on sheets of paper to accurately portray the appearance of the living organism. Herbarium specimens also give precise information on the time and place of collection, as well as other pertinent details. The study published today used nearly 700 such specimens going back over 80 years to show that flowering white trillium plants in modern, deer-browsed areas of southern Quebec have a significantly lower leaf surface area than those in un-browsed areas and those preserved as herbarium specimens. This decrease in leaf area indicates a lower reproductive potential. Most of the herbarium specimens used were collected prior to 1980, when deer density in southern Quebec was very low. This is the first instance of herbarium collections being used to evaluate the effects of a large browsing herbivore on forb size. Such studies are usually carried out using exclosures or clipping experiments. White trillium is a perennial forb present throughout eastern North America. It reproduces in mid to late May, when white-tailed deer will preferentially consume large plants bearing flowers or fruit, resulting in complete defoliation. 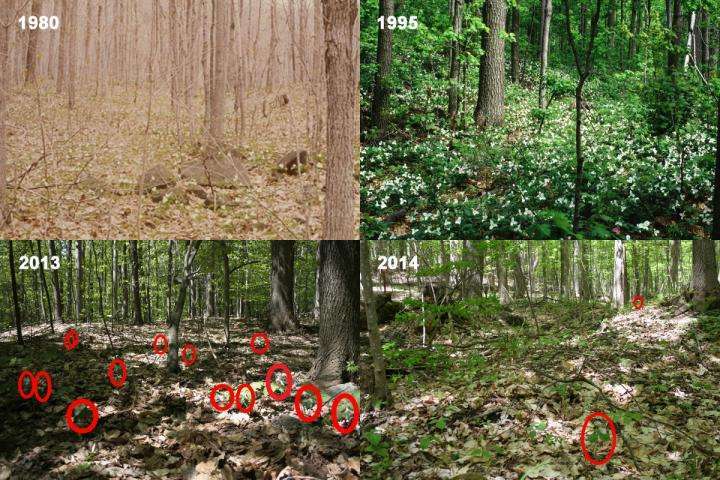 Repeated browsing of this and other long-lived plant species by deer is known to decrease plant leaf area and height over time, as well as reducing the proportion of flowering plants, leading to decreased potential for survival. Severe overbrowsing can lead to local extinctions of white trillium and other plant species. A recent explosion of deer populations due to hunting restrictions, increased food supply, and reduction of natural predators is creating a serious plant conservation issue in some areas. A long-term historical perspective on the impact of browsing by large herbivores is difficult to obtain due to the local and short-term nature of most vegetation studies. This research represents a novel use for herbaria at a time when both collecting activities and funding for collection maintenance are waning. "Our paper provides an additional example of the usefulness of these collections, not only to identify species, but also to study the impact on the environment of several disturbances," says co-author Claude Lavoie, "...herbarium specimens represent an inexpensive tool to assess the impact of large herbivores on plants. Unfortunately, this possibility is seriously hampered by the decline of herbarium specimen collecting throughout North America, and the precariousness of museum collections."